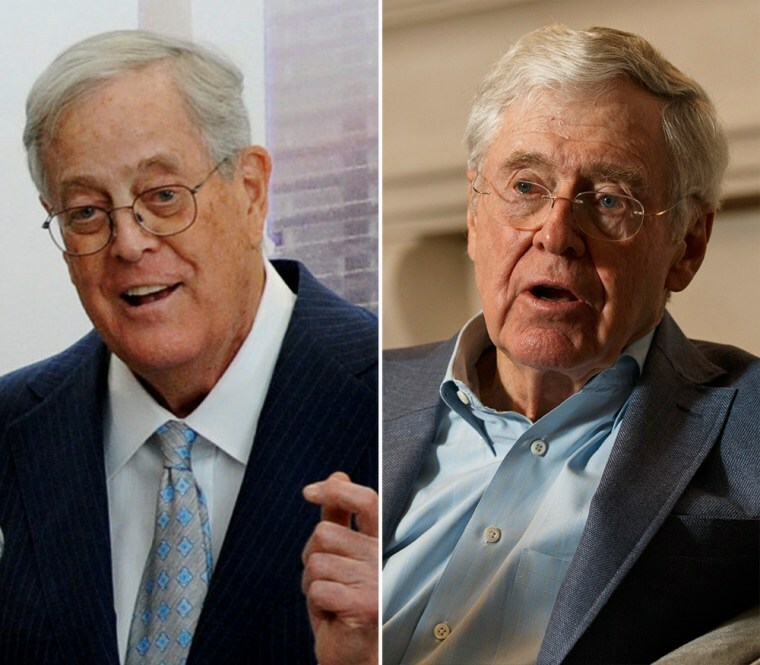 WASHINGTON — Billionaire industrialists Charles and David Koch are well-known for pumping tens of millions of dollars into so-called dark money nonprofits — groups that actively promote or criticize candidates for office but are not required to reveal their donors. Not so well known is the duo's role in underwriting and sculpting the legal landscape that led to the court decisions that made possible these and other groups such as super PACs. The Center for Public Integrity investigated an array of organizations that have participated in legal challenges dating back 40 years that have resulted in a system allowing unlimited sums to be pumped into modern elections. It's a system that both Republicans and Democrats now fully rely upon ahead of 2018 midterm elections that could reaffirm — or torpedo — President Donald Trump's congressional majority. "They're not the only group in the game," Larry Noble, general counsel for the Campaign Legal Center, said of the Kochs. "But I think what you'll see, it's a deep well with a long-term commitment." The Center for Public Integrity identified the sources of $293 million received by groups that lodged formal arguments in key campaign finance deregulation cases. It also identified $64 million in funding for groups that defended campaign finance regulations, including significant cash from liberal billionaire and Koch foil George Soros. Funds underwriting the legal campaigns to shape how money influences politics come from individuals, corporations, unions, foundations and family trusts of all sizes. Some have come from surprising sources, according to tax records, internal documents and other records reviewed by the Center for Public Integrity. Not all the money identified went toward campaign finance fights, and much of the funding is simply untraceable, since most of these groups keep their donors secret. But the funding that is known offers key clues about the players behind the greatest unraveling of campaign finance regulation in U.S. history. One must travel back in time more than 40 years to understand how today's motley collection of campaign money laws came to be — and how limits on political fundraising and spending have unraveled along the way. It began with the Supreme Court's Buckley v. Valeo decision of 1976, a reaction to Watergate reforms passed by Congress. The court upheld limits on contributions to political campaigns, but in a critical part of the ruling that would play a major role years later, allowed for unlimited spending on campaigns. The Buckley v. Valeo fight also helped inspire Ed Crane, former national chairman of the Libertarian Party, which was one of the case's plaintiffs, to create a libertarian equivalent to the predominant think tanks of the day — the liberal Brookings Institution and the conservative American Enterprise Institute. With $500,000 from Charles Koch, Crane became the leader in 1977 of the Cato Institute, previously named the Charles Koch Foundation. In 1981, it moved from San Francisco to the heart of American political power — Washington, D.C. Ever since, the Cato Institute has tirelessly fought against campaign finance laws it considered antithetical to its philosophy of small government and largely unencumbered speech. "We stand against campaign finance laws in general," Cato Institute research fellow Trevor Burrus said. "We believe that most campaign finance laws are unconstitutional. They are clear impediments of political speech." For the Kochs, was Cato an ideological enterprise or vehicle for self-interest? Both, to some degree. Avowed libertarians, the Kochs control a vast empire of heavily regulated companies that would undoubtedly benefit from less government intrusion. Coloring the political system red instead of blue has practical, financial implications for the Kochs, who overwhelmingly support Republican candidates and causes. The nation's campaign money system largely stood unchanged until 2002, when Congress passed the Bipartisan Campaign Reform Act — commonly known as the McCain-Feingold Act, named for its two Senate sponsors. The law curtailed a variety of political activities and included a ban on unlimited "soft money" contributions — corporate and union cash — given to political parties. It also attracted an immediate backlash by foes of campaign finance legislation. Twelve suits brought by more than 80 plaintiffs were consolidated as McConnell v. Federal Election Commission, named for Mitch McConnell, a U.S. senator from Kentucky and current majority leader, who has long been in favor of liberalizing restrictions on campaign contributions. Those joined together under McConnell included the National Rifle Association, the Republican National Committee, the National Right to Life Committee, the American Civil Liberties Union, the AFL-CIO, the U.S. Chamber of Commerce and others. Generally, the backers of these campaign finance case litigants are well-known, but not always. Take the ACLU. Despite its reputation as an unabashedly liberal organization, the ACLU has routinely aligned itself with libertarians and conservatives in recent legal fights against campaign finance regulations. Who are the top donors to the ACLU? Tops is the left-leaning Sandler Foundation, having given more than $24 million to the ACLU and the ACLU Foundation since 2001, according to the Center for Public Integrity's review of tax records. Lateshia Beachum is a reporter on the Center for Public Integrity's federal politics team. She has covered community news for Syracuse, New York’s The Post-Standard, billionaires for Forbes magazine and health science and politics for The Washington Post.